And let me tell you: he knows how to use them! He was batting those things and peering coyly out from under them at the ladies since the tender age of one(see below)! (amazing how they just *know* these things!) Women LOVE him, he's gonna be trouble!! * Get your mind out of the gutter! This is still a PG site! And here was some inspiration for this card below! Have you tried these? YUM! I've always thought Diet Dr.Pepper definitely has a very "diet" taste, but I REALLY like the chocolate and cherry together in this one. And love the can, of course! (although I never need an excuse to design with chocolate and red or pink!) Coke Zero still remains my fave, however. Why do they even still MAKE Diet Coke? Thank you everyone who left post-blog candy comments, way more than I usually get!! And all I had to do was say "the magic word"**?? ... the frog is filling in! Yes, it's about time I started letting all my Gina K stuff mix and mingle!! Look how perfectly the little sling fits in his hand! Now I realize this makes the baby* he's carrying incredibly tiny, or the frog terrifically huge, but I'm fine with that! Frogs don't have eyelashes either, but they do in my world! I covered the baby blanket with Stardust Stickles (to match my glitter striped DP) rather than choosing a color, this way I can send it out for a boy or girl when the occasion arises. I used a Sakura glaze pen on his eyes. (I just realized I forgot to give the image a shadow, doh! (oh well, I will later, but not taking another pic!) I chose to put the stripes going horizontal since he's hopping along, and stamped my greeting on the two colored lines, look how nicely that fits! ** for the time being, I'm sticking with random.org. While I get what people are saying about how it "always picks in the middle", at the same time "the math person" in me says that it "always" picks in the middle because there are more numbers in the middle, while there's only one first and last number. So on some of these candy giveaways with let's say a 1000 plus comments, maybe 1 or 1000 has never been chosen, but probably also never 5 or 99 or 832 or whatever unless you've done 1000 giveaways to see...KWIM? I could be completely wrong here, though, it's been known to happen! Dad,(math major/genius/regular "Hands, Head and Heart" reader) can you help on this?? Either way, I STILL think you have a better chance with random.org than random.DH (who will guess the same number every time because he really couldn't care less about my blog candy results) or random.Jonathan who only counts up to 100 so far, and while he says numbers like "10,000 million! ", I'm not quite sure he's completely aware of all the numbers in between, ya know? oh, and printing out and cutting up 200 strips of paper for a drawing? um, let me think about that...no. not for me. Sorry! *** Lee's a winner, but she's wrong! PS It always feels so quiet and lonely AFTER a blog candy winner is announced, so maybe you can leave a comment congratulating Lee, or about the card, or even vent about how you never seem to win anything before you go? pretty please? NO, I'm talking about my next release! I realized I've forgotten to share some other notable and fun projects submitted for last month's contest (I don't have to stamp something every day, do I?) So glad I remembered becuase there are really some great ideas to be CASED from these entries, as well as I've been so hoppy lately I'm forgetting to still be hippy. Here are just a few, more to come! 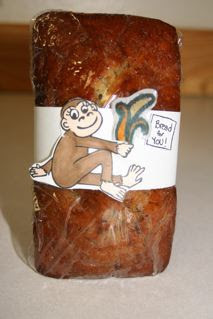 This card was made by Heidi Schmidbauer. (I'm not sure if she has a blog or gallery, I can't find it! Heidi??) I loved the simplicity of this card, it colors (Real Red is my fave and with black and white one of my fave combos, Just So Striking!) and layout, and I HEART the way she wrote her OWN greeting in the three balloons! So sweet! Expect to see more of these from time to time, yours may pop up here one day soon! Blog candy announced tomorrow, still time to enter! I have been struggling to make something for this week's sketch challenge for you tonight and it just not working out the way I'd planned so far (and my camera is in my car!) 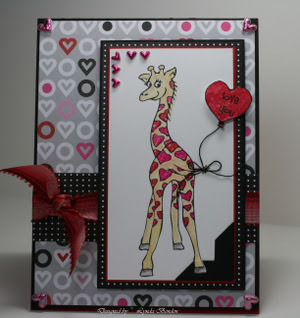 Luckily I do have a few new cards I made for the Gina K release I have not yet blogged about! The flower basket image from "Baskets of Happiness" above was a great match for this a pattern on the DP and all the colors came from the paper, I didn't have to think abut it at all(YES!) I used my watercolor crayons and Aquapainter to color my flowers red and turquoise to mimic the flowers on my paper and used a bright pink for the basket. I have a tendency to put too much color on when I'm watercoloring and not allowing enough light or white space for my highlight spot, here I think I did a better job than usual on the basket and stopped in time. If you manage to catch the light this way, I think it is the most striking part of a coloring job, the part that HAS NO color! 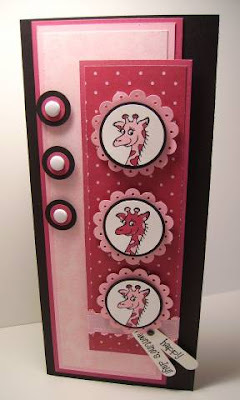 I ran a long strip of Cool Caribbean CS into my key tag punch for the greeting because I wanted the corners to be rounded like the other elements on my card. 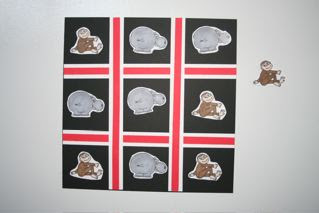 Here I also centered the strip in between the brown cross pattern. Two green Primas (for a total of three round things on the card, including my focal point, a pleasing odd number) pulled in that lovely lime from the DP and turquoise brads in the centers were the finishing touch. * Sorry I don't have a funny title for you. At first out of desperation and lack of time I called it "Short Post Tonight! ", but then when I was done, I realized it wasn't so short after all! Trying to be witty, I then thought I'd call it "I'm a Basket Case!" but that made it sound like I CASED this card. Which I didn't. So hoppy some of you are excited about the candy! (30 minutes after I posted I'd had visits but no comments, and I was sweating a little that I might have crummy candy!) WHEW! However, NO one yet has correctly guessed the number of animals in my March release! muwahahahahaha!! Still have to finish the "Hoppy Treats" and photograph!! *** Check back tomorrow! Don't forget to comment on the BLOG CANDY post below if you haven't already, winner will be announced on Thursday! ***Can I be frank? I ATE all the Sugar Babies, gotta go buy some more now, sorry about that!! and/or an animal you'd like to see me include in a future set! Good luck! I will post the winner on Thursday! This post will stay at the top so please be sure to scroll down when you check in each day for new cards and projects until then. We went to visit family in San Diego when my son Jonathan was eighteen months old (he'll be 6 this summer). These are photos I took of his first time seeing the ocean. Doesn't he look so thoughtful and serious? Some of my favorite pictures of him are when he looks so young, but so old at the same time. I cropped the picture below in half (as much as I love seeing my innocent child in it, it didn't quite fit the sentiment I wanted to use) and printed (on an HP Photosmart) on photo quality paper. I stamped the cross and "He is Risen!" from Gina K's set in Burnt Umber Palette Ink directly on the paper. I contemplated putting the greeting directly on the sun, which would have been a cool effect, but chose instead to put at the bottom right, better composition and it kind of looks like it is written in the sand, reminding me of the "Footprints" poem, a favorite of mine. The base of the card is SU! Chocolate Chip and I tied some natural hemp (which always makes me think of "beach!") on the spine. This is about as simple a project as you'll find, but I love how it turned out. Try stamping on some of your own favorite moments you've been blessed to capture on film, they make wonderful cards. This next one is on glossy cardstock which makes it difficult to photograph, at most angles you'll get a glare from the flash, so sorry this is a little muted. I used the retired SU! Late November spectrum pads, one of my favorites it makes the perfect sunsets. I used my rubber brayer to roll it onto the cardstock in one direction, and once I got the colors blended to my satisfaction I reinked the brayer, turned the glossy paper and rolled it with the color facing the other way so I had a mirror image of the spectrum (KWIM? see how the yellow-orange area is the largest and it goes back to olive at the bottom...) This gave me the colors I wanted and allowed me to fill the whole space on the vertical card with the color stripes going across rather than up and down(since the width of the pad is better suited to go across the a horizontal card) I sponged on some white craft and little of the eggplant to make it appear a little misty, looks very atmospheric in real life. Last I embossed the cross and greeting and attached with gold brads on brushed gold CS and finally on the eggplant. I really like using brads as an embellishment with this cross, to symbolize nails. I really love the simplicity and meaning of this set, so glad to have it. I've bought a few others with just scriptures in the past, but the artwork in many religious themed sets has not really inspired me before. I haven't yet made one with the scripture from John included in the set on the front, but I plan to, and know I will be pulling this set out again and again for various occasions. PS Did you know: spellcheck button is back in business! For awhile there I wasn't even checking anymore but then yesterday thought I'd give it a try, and BOOM! yellow boxes everywhere! This is very exciting, thanks for hanging in there with my alphabet soup every day the past few weeks! How to Draw and Piece a "Onesie"! I said I was going to share another froggy card next, but decided it could wait, after my frog paper piecing, I thought I'd share this one first: a bunny dressed as a bouncing baby boy! (Directions on drawing the onesie follow) I used the same DP for the background and my tulips. This time I decided to skip the safety pin and used the bashful blue brads and ticket punch for the corners. I did a white on white mat with my scalloped nestabilities. I think once I find a suitable frame or shadow box, I will frame this to give as a gift instead of leaving it a "card". Sometime they have nice pain white ones at the dollar store, not this week, so I will go check out IKEA. I will come back and post an after pic when the project is "just so", along with a couple other fun ways to dress up a plain frame. Still working on getting my blog candy photographed it will be up later this weekend! I'm back with that hoppin' image from the other day (I sent this card out to one of my Hippy Mentions today, but changed the greeting, as I really have no idea when her birthday is!) I goofed and went outside the lines with my brown when coloring and couldn't get it to go away enough with the blender, so I just decided his shadow would have to be brown and piled a bunch more on(because you KNOW I'M not stamping it over again!) I needed some colors I didn't have Copics for and I'm just still much better with shading with my watercolor crayons, so I used them on the balloons with my Aquapainter. The rose and green balloons are popped up on dimensionals. When I drew this image I knew the pouch was ripe with possibilities, couldn't wait to have a bunch of balloons streaming out! (wait til you see my NEXT balloon card-HEE!) The DP is from my DCVW adhesive mat pack. I made the zigzag border with my deco scissors. s you can see, I still need work with the Copics!! Some areas look pretty good, others not so much. Unsolved mysteries: Can someone tell me why some leave NO lines (pink) and others do(brown)? And why some practically disappear altogether when applying the colorless blender to them(brown) and others remain unchanged???(PINK!) I'd love to know!! When I drew this frog, I thought a lot could be done with this pose! I love frogs and I had a few in my stamp collection already, but they're all just sittin' there, ya know? I mean, if you have a frog, you want to see some leg, right?? And a little "toe cleavage" while you're at it! So I really wanted to showcase "the assets", and have a sample to demonstrate how you can make him jump in or out*, cut or mask him to break the surface, or emerging victoriously with a little somethin' he picked just for you. :) (Doesn't he look so pleased with himself?) I've got plans to make some dancing frogs, too (tiptoeing with tulips!) and check out Lee's Frogstravaganza! * I skipped inking up the droplets in my puddle image on the first panel to look more like still water, since he has yet to make his big splash! THE DIRTY DOZEN Challenge for February will be up tomorrow, 2/20. Type in keyword DCS208 to view all the cards made by all current and former Dirty Girls using DD alumni images! 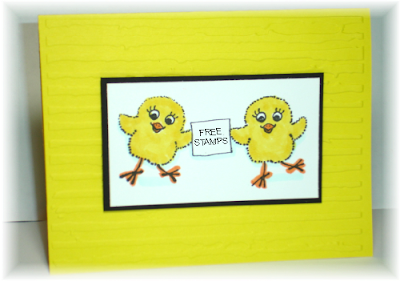 I'll give you a hint about the one I've submitted, it's called: "Froggy Went a Courtin"
Just So Hoppy Contest: FREE STAMPS! Here are the Contest DEETS! Email photos of your "Just So Hoppy" entries to mmuenchinger@grandecom.net Please send these as a jpeg if at all possible, it makes for easier viewing and uploading if I want to share your pics of your projects on my blog. You must ENTER to WIN! I saw several projects I really liked on other blogs, but they weren't submitted for the contest! or over and over, hippity-hop! I'll come back later and post finished cards with the rest of these(you'll hop right out of your seat when you see the kangaroo!! ), I realized equipping you ASAP with hopping info now that your sets are arriving was a stamping emergency! My Brush with a Celebrity (Artist)! When I went to the counter to pay, THERE was the man I recognized before with some paint, so I had to ask, "Are you Joe McDermott??" Now if you live in Austin and you have kids, you know that Joe McDermott is one of the most popular (and our personal favorite) "kids" musicians in town! We've seen him play countless times at libraries, festivals etc and he always packs the house because of his hilarious songs that children and parents alike enjoy (and many of his songs are about animals! so you know I really dig 'em) There were plenty of times I could have stayed after the show to introduce myself(he's popular but it's not like he's got an entourage or anything) but in this setting I felt compelled to strike up aconversation. And it was him(I knew it) So then I HAD to ask what he was buying his paints for: turns out he's illustrating a book for one of his songs about a pet skunk named Stinky. So then I HAD to say, "I'M an illustrator, TOO! "* and started babbling about my new stamps and blog, gave him my card, dished about an illustrating class he's taking and recommended etc etc. What was so cool about this chance encounter: one of our favorite songs of Joe's is about a baby kangaroo, and I just drew one! HEE HEE! So if you want some songs your kids will LOVE and YOU won't mind hearing over and over (like some other children's groups that will not be named here), check out Joe McDermott's site, that's my TIP for today. And look for his books in the future, I guess! ANYWAY, the card! I used my Copics here. I need practice with the blender. You can achieve lots of different shades with it, which saves money, but it can look blotchy if you overdo it...I'll keep working on it, I definitely like 'em though! I paperpieced the 'brella top with the background DP, using some of the adhesive DCVW DP I mentioned yesterday. I made this card today for one of my Hippy Mentions (I'm almost caught up now with all the mail outs I have to do!) Where'd that EGG come from? IT'S MY NEW BALLOON in the Just So Hoppy set! Stamp it on CS, cut off the tied end and draw a quick zig line through the middle to make a"crack". Cut out and cut on your crack line. Mount on dimensionals, add your "hop line" from the set, and he's popping (peeping!) out! "You crack me up!" would be really fun as a just because greeting for ths card. TIP: You can also make really cute colored and decorated "Easter" eggs with this balloon using patterend papers*. To all my PEEPS out there: thanks for keeping me smiling and laughing each day with all your comments! I decided I wanted to frame up this little "scene" in a circle. Although I have the circle Nestabilities, I still gotta have my coluzzle for some projects! This time I chose the "blue" track, (third one in) so his ear, the butterfly and umbrella will fall just outside the mat. Slide your blade around the track, up to the edge of the image, take it out and insert and cut again on the other side. Take your snips or scissors and cut around the outside of the image where it's still attached after you pull the template away. My husband, Paul. My best friend, the love of my life. I am so thankful to have him forever. He's also an amazing father. The kids dote on him. He is silly, kind, an expert tickler, wrestler, snuggler, and patient with them when they "help" in his workshop in a way I am NOT when they're in my stamp room! Thank you, Paul, for all you do for us, and for being so supportive of my new venture! I love you! Happy Valentine's Day, everyone! 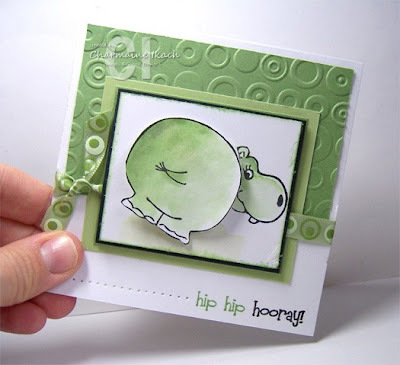 My interview on Featured Crafter Friday will be up tomorrow, 2/15, at 6AM CST, and I will have a new card with "Just So Hoppy" you have not yet seen, please check it out! *If I ever share any recipes on this blog, it'll be his, not mine!! I was going to include one of my faves he made Sunday in honor of my stamp release, but I'll have to save that for another night, he's been waiting very patiently for me while I finish my entry, gotta run! 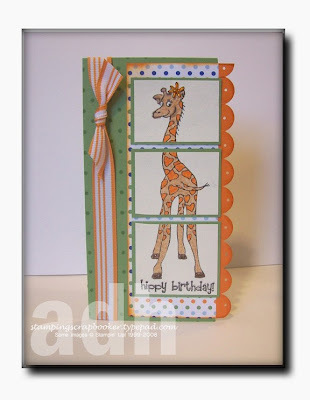 TOMORROW I WILL BE ON ANDREA HAYS' "FEATURED CRAFTER FRIDAY" -PLEASE CHECK IT OUT!! Look, Moms: Fast, FREE Valentines! Tomorrow's Valentines day-ackk!!! Despite me preparing all these projects for Vday these past two months for the set and the blog, it completely slipped my mind to make the 16 goodies I need for Jonathan's calss tomorrow! His school has a no candy policy(booooo! but that's okay, I've eaten it all anyway) so here's what I'm doing (because I do not have time now for 16 hippy treat boxes-urghh!) Here's a link I received for Chuck E Cheese Valentines, hope you can open it; if not, sign up on their website for email discounts, you'll never have to buy tokens again! There are 4 valentines to a page, you just print out on cardstock, cut, and each can be redeemed for 5 tokens! What kid wouldn't love that?? On the back side of each I will stamp my hippys and color(or maybe let Jonathan color... I suspect he will embrace this project with enthusiasm, and then tire out after the third one, leaving it to me, that's kid of how it always goes.) I will add a pic later, I'm out of memory space on my camera, gotta transfer the pics and run some errands, I'll be later! My William is 3: Goodbye, Terrible Two's? But how could you stay mad at this face for long? My favorite place to get a cake for a party is Costco, 15 bucks for a huge, delicious, filled cake that serves 40. They decorate them for a free, and do a nice job, but I typically like to decorate it myself. Some themes are more difficult than others, but I found a really simple way to customize my kids cakes: whatever they're "into" at the moment, dinosaurs, licensed characters ,whatever, they have a lot of already laying around our home. So here's my big TIP: Instead of buying MORE cake topping stuff, put their toys on the cake (after washing them!) Here I used Go, Diego Go! Rescue Center Mega Bloks, and a bunch of candy coated chocolate rocks (these are so cool, they really look like tumbled stones) I was so pleased with how it turned out! The kids thought it was "the best cake EVER!!!" I will have to try to get my Reverse Topper card with the frog I made for the Gina K gallery posted tomorrow, I have lots of pics, just need to finish the post, but now it's time for bed, night-night! 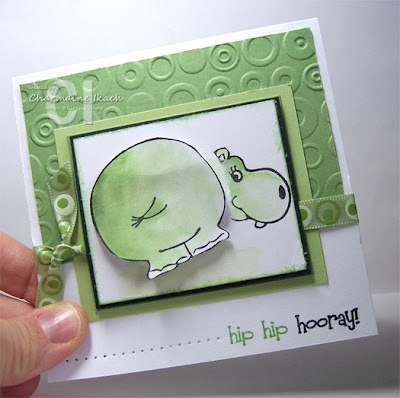 The lovely and talented Charmaine is sharing her brilliance over at her blog with an incredible step by step tutorial of her Hippy Mention Tilt Card! Go see how easy it is, and then get your own hips ashakin'! And speaking of rockin' tutorials, my Hippy Winner Linsey has graciously shared "the secrets of the magic lamp" over at her blog, with a list of supplies needed and just how she made those ribbons curl! I wanna see more lamps from all of you! 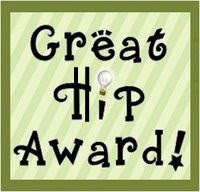 I give both these ladies the Great Hip Award! Tomorrow I will be sharing a bunch of pics other 3D items that were submitted for contest, along with some other fabulous hippy sightings, thanks for stopping in! A "hop mark" is included that works with all animals, whether they are bouncing left or right! Have fun putting them in motion! While a few of the greetings and images provided allow for holiday projects like Easter and St. Patrick's day ("good luck"), the set has been designed for year round use. Note the baby greetings and "thank you"! All the images and greetings in this set are meant to coordinate with the Just So Hippy set! Mix and match the things the animals will hold, and create gorgeous MIXED balloon and flower bouquets when you have BOTH sets! Three of the animals are great opportunities to try out Fun Flock for a fuzzy, "touch me" effect! Cut out and pop up the different props for a great 3-D effect. Use a toothpick instead of drawing a line for the handle, and you'll have "a drink umbella"! The butterflies are meant to be cut separately, but by putting them on the same block you can make quick gorgeous backgrounds! Position them to have your animal watching them fluttering by, or omit the dotted trail and you can stamp them lighting on your animal's hands, head, ear, etc. Stamp lots of flowers and clover at the bottom of your paper and then add your animal(s) and a "hop" to make it tiptoeing through the tulips, picking blossoms as they go! The puddle can be used for the frog to leap out of (or into, depending on the direction you stamp him) The other animals can be jumping through them using the hop marks with the puddle. Use the drops for rain, a spray behind the frog as he's coming out of the water, or on either side of the different animals' feet if using with the puddle. Stamp the little greetings on the balloon or on the bunny's tummy. These greetings fit on MOST tags, punches and dies out there, have fun! Trim or omit the TIED part of the balloon and you've got a perfect EGG! STamp the small images from the hippy or hoopy set on it for patterned eggs or balloons. Ink up just the outline of the chick, omitting the face, and you can have a back view! Omit the handle on the handle of the basket, draw a few vertical lines on the top for candles poking out and you've got a beautiful birthday cake! Flowers spilling out of the umbrella would be gorgeous for showers and announcements. Try making the animals holding hands. Substitute primas, velvet or punched blossoms for the flower stamp. The flowers and balloons and basket can be held from their mouths, tail, or hands! (The basket can be looked over the elbow, doesn't have to be in the fingers.) Have fun coming up with your own fun compositions and combinations! The possibilities are endless! Sponge a cloud background, add an animal and a cluster of balloons and they'll look like they're being lifted/drifting into the sky. Every post needs a pic, so above is a project I created for the Gina K Design gallery this month, using my Just So hoppy set and the Free with Three set Tag, You're it! More deets about these little watering cans later, but I love thow the different tag borders and flower and heart stamps from that set work on the SU! Scallop punch! Well, I was so surprised and pleased that so many people guessed a kangaroo, I'm hoping that means you've all been yearning for one for your stamp collection?? I'm guessing 95% of you don't have one! And why not? They're one of the cutest animals EVER! So I had to make you one, and that little pouch is going to have a LOT of uses! ;) )Did you notice the little heart nose? * It's subtle, but it's there) :) The set is now available purchase at Gina K Designs, I will be posting a tip sheet fo it tomorrow! The left hand is hidden by the cake, but it's fingers form a nice litle "grip", so he'll be holding all sorts of other things, wait til you see! I wanted to show, though, here how you can mount somthing on top of the animals' hands and it will look like they are presenting something with a flat palm, works very nicely! Finally, I mounted it on dimensionals and put it on this circle mat, which is fun with this DP, and added stickles to the cake and candles. What do you think? Are you ready to bring this sweet kangaroo home?? 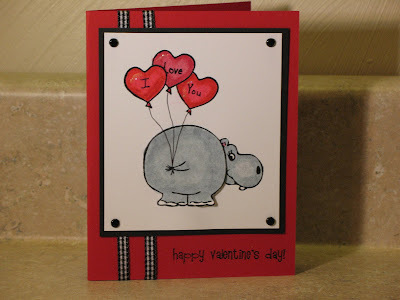 Lee Murphy-I love this soft, monochromatic card! All the piercing, the oval frame, ribbon, and patterned papers made for such a dreamy little baby card. 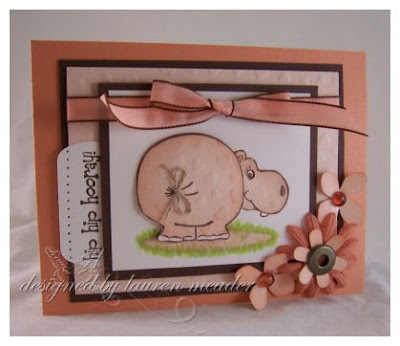 Lynda Bynden-There are so many things I love about this card. This funky heart paper she started with really made for a great card, and she pulled in so many different elements to showcase it. I love all the metallic bing she piled on, from the glitter on the heart spots and balloon to all those heart-shaped brads and shimmery ribbon. The little black bow she tied for the balloon was just right! Lauren Meader-So very "Lauren"! gorgeous colors, layout, love all the flowers, and so cute the way she embossed the hiney with hearts and tied a little hemp bow around his tail, it's like he's trying to peek around to figure out what he was trying to remember! HA! 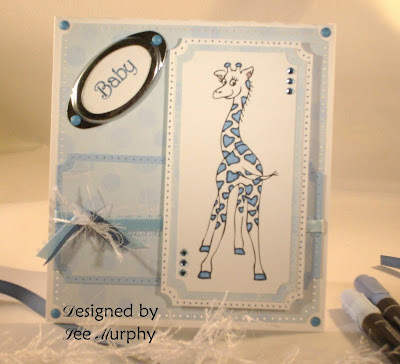 Amber Hight- what a fantastic layout for this giraffe, I love the three sections. I also thought her scalloped edge, dotted paper and colors were so fun and fesh. And did you see the little flower she tucked behind the ear?? Now that's sassy! Jessica Knight-This layout and colors on this next card are just so stunning! I love that black with the pinks! And the huge brads and alternating colors on the giraffes are just perfect. I also love how she spotlighted and repeated just the face in these scalloped punches. Outstanding work, Jessica! I will be sharing SEVERAL other projects/3D items and gift entries on my blog over the next few weeks, there were so many cute unique ideas to share, thank you everyone who gave me a peek into what you've been creating! If you played but did NOT win the free set this time (please keep playing! ), I hope you'll still be inspired to get "Just So Hoppy" to enjoy with your hippys, don't let the fun stop now! If you thought you could do a lot with the first set, you won't believe what you can do with the second, and when you have BOTH, oh my! I can't wait to see what people will come up with for the NEXT contest! I also hope even more people participate for a chance to win one of my future releases! I am almost finished designing the set, but exact release date for it is yet to be determined. The competition starts as soon as the new Gina K release orders start arriving in your homes, end date TBA soon(I'm thinking April? maybe May...) Have fun! Tie One On! Hang it Up! Discover Your Inner Funky (Monkey) Diva!